Trying To Restart Peace Talks, Kerry Will Fly To West Bank : The Two-Way The trip comes after Palestinians balked at some of the conditions for returning to negotiations. The Mideast peace process has been a priority for John Kerry as secretary of state. This visit is his sixth to the region in as many months. 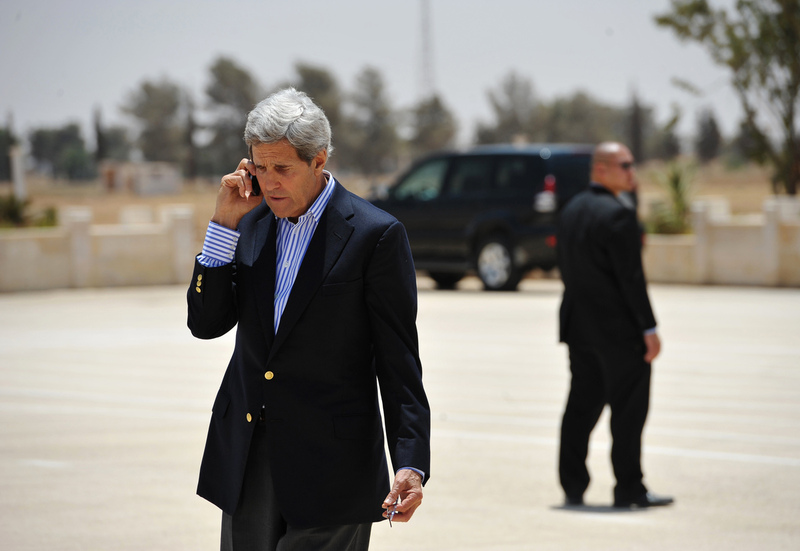 Secretary of State John Kerry speaks on the phone at Mafraq Air Base before boarding a helicopter to Amman on Thursday. U.S. Secretary of State John Kerry announced a last-minute trip to the West Bank this morning that's intended to jump-start stalled peace talks between Israelis and Palestinians. The trip comes just hours after the Palestinians said they would not return to the negotiating table unless Israel agreed to begin talks using the borders that existed before 1967, when Israel captured the West Bank, Gaza Strip and east Jerusalem. "Kerry was planning to meet Palestinian President Mahmoud Abbas, the official said. On Friday morning, he met chief Palestinian negotiator Saeb Erekat in Amman and then scheduled the short helicopter flight to Ramallah, shifting his campaign to renew the peace talks into diplomatic overdrive. "A Palestinian official confirmed that Kerry would meet Abbas Friday afternoon. Both officials spoke on condition of anonymity because they were not authorized to brief reporters." The Mideast peace process has been a priority for Kerry as secretary of state. This trip is his sixth to the region in as many months. "U.S. officials played down hopes that negotiations would begin soon. "'There are currently no plans for an announcement on the resumption of negotiations,' Jen Psaki, a spokeswoman for Kerry, told reporters in Jordan. An Israeli Cabinet minister said no deal was imminent. "Kerry has been shuttling for months in search of a formula to allow resumption of talks after a nearly five-year break. Talks have been stalled since late 2008." On Thursday, President Obama called Israeli Prime Minister Benjamin Netanyahu and asked him to continue to work with Kerry. Time Magazine, by the way, takes on two questions that you may be asking yourself: What's different this time? And is John Kerry wasting his time in the Middle East? The short answer is that Kerry has gotten closer to getting the parties back to the negotiating table than anyone else since 2008, but the positions of both parties remain largely the same.